DONNA — Mayor Rick Morales and the two newest members of the city council this month filed mandatory campaign finance reports after the deadline. Morales submitted campaign finance reports on Feb. 9 and Councilmen Arturo “Art” Castillo and Oscar Gonzalez on Feb. 5 — about three months after the November election. The Texas Ethics Commission — the state agency which oversees campaign finance reporting — mandates local candidates file reports 15 days after the appointment of a campaign treasurer as well as 30 and eight days before an election. Candidates who were in a runoff, like Morales and Castillo, must also file reports eight days before the election. Morales loaned himself $60,000 for his campaign, according to the recently filed reports. He reported a sole political contribution of $5,000 from Jimmy Gonzalez — a Tejano singer and guitarist with Jimmy Gonzalez y Grupo Mazz. Morales, Gonzalez and Castillo — who ran as a slate and have been sitting on the city council since December 2017 — used most of their campaign money on “contract labor,” according to the reports. Castillo and Gonzalez said Tuesday that contract labor included paying for campaign workers to knock on doors and put up campaign signs throughout the city. Morales paid $2,000 for contract labor to Sylvia Handy — the former Hidalgo County Precinct 1 Commissioner who spent two-and-a-half years in prison for tax fraud and harboring immigrants who were in the country without authorization. 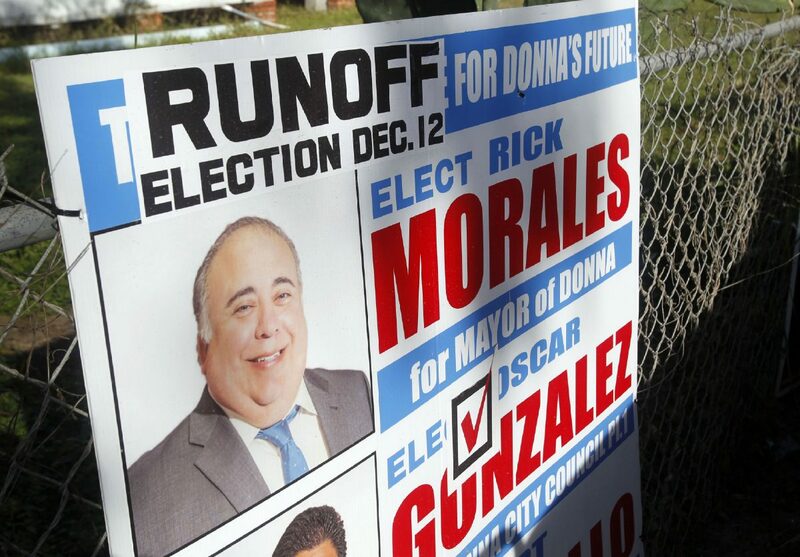 The Morales campaign also paid $1,500 to former Donna City Manager P.R. Avila, according to the report. In total, Castillo and Gonzalez paid $1,025 and $1,125 to campaign workers, according to the reports. Morales paid the most to campaign workers: more than $35,000. “A lot of people helped us for free,” Gonzalez said. “They were out there because they wanted a change,” Castillo added. Morales was unavailable for comment on his campaign finance reports due to an illness in his family. Reports must be filed in a contested race when campaign contributions or expenditures exceed $500, according to the Texas Ethics Commission’s website. Castillo and Gonzalez each accepted a $1,250 campaign contribution from Javier Hinojosa. SAMES Engineering, Millennium Engineering, Perdue Brandon Fielder Collins & Mott LLP and Linebarger Goggan Blair & Sampson LLP donated $1,000 each to Castillo and Gonzalez, according to the campaign finance reports. The filings came approximately two weeks after The Monitor filed a public information request for the reports in January. No reports by the mayor and councilmen had been submitted then. Castillo and Gonzalez turned in two sets of campaign reports — reports due 15 days after the appointment of a campaign treasurer and during the runoff, although Gonzalez successfully avoided the runoff by being elected outright. Morales also filed campaign reports due 30 days before the election and during the runoff. Local candidates who file late may be subject to fines that are typically assessed only after a formal complaint process is completed. “Just about every complaint that the commission addresses is initiated through the public,” said Ian Steusloff, the attorney for the Texas Ethics Commission. The commission does not disclose or confirm when a complaint is filed.